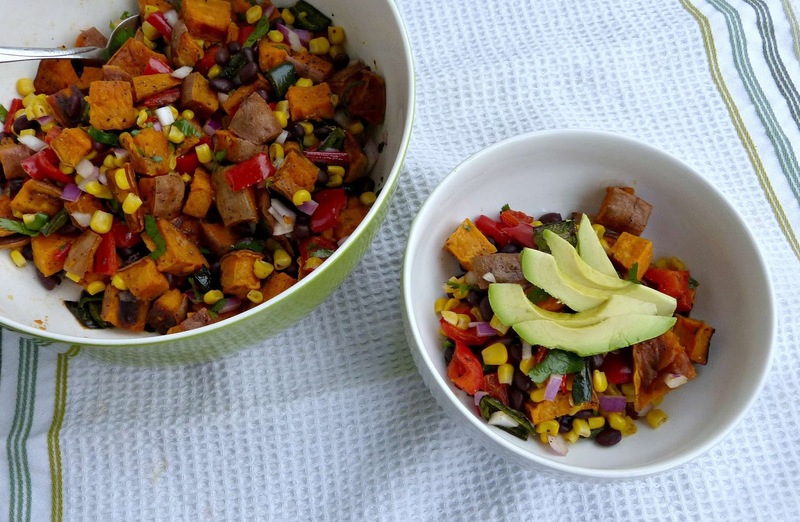 This fresh and simple sweet potato salad is a light, healthy, and flavorful alternative to any traditional picnic potato salad. You won't even miss the mayo! Sometimes-- as was the case with these tostadas-- I accidentally make a vegan dish. I'm not a vegan or even close to one (because cheese), but in the summer it becomes really easy to make a totally meatless vegan dish that's fresh and flavorful. Summer veggies are so colorful and full of flavor that they don't require a ton of additional manipulation to turn them into something really tasty. 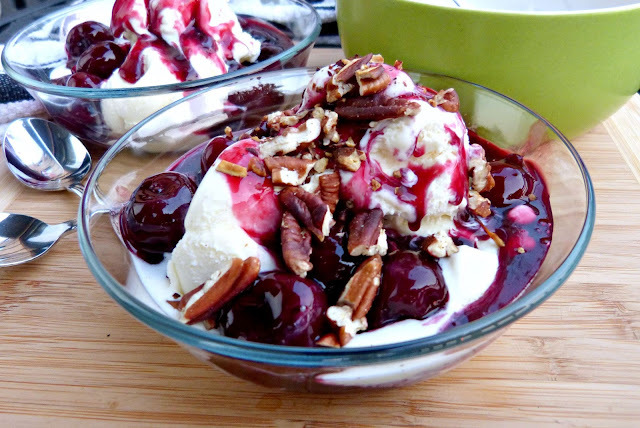 And a quick easy recipe that is satisfying is exactly what I want in the summer. I made a huge batch of this sweet potato salad one Sunday to serve as a side dish for some spicy grilled salmon filets. With the combination of sweet potatoes, beans, and vegetables, this is really the only side dish you need. Just add meat! I made a huge batch of this though, so I portioned it up, added sliced avocado, and suddenly had a super filling vegan lunch to bring to work for the next few days. 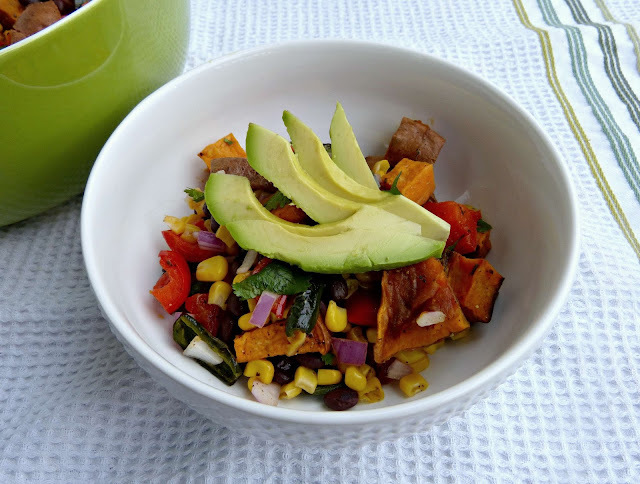 I love the savory sweetness of a roasted sweet potato and that really makes the perfect base for this salad. 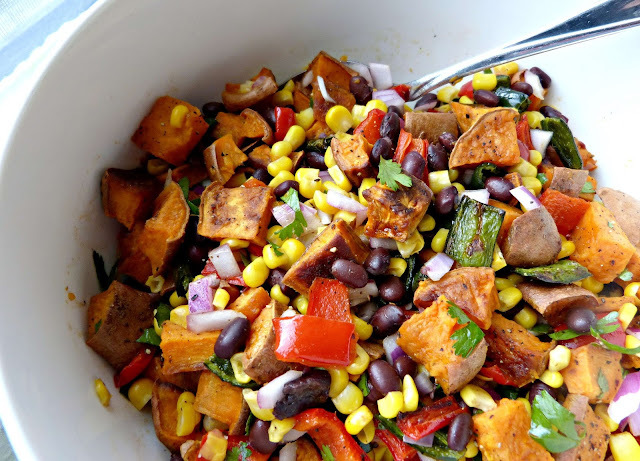 Sweet red peppers and corn, spicy poblanos, crisp red onion, and hearty black beans all complement the potatoes nicely. 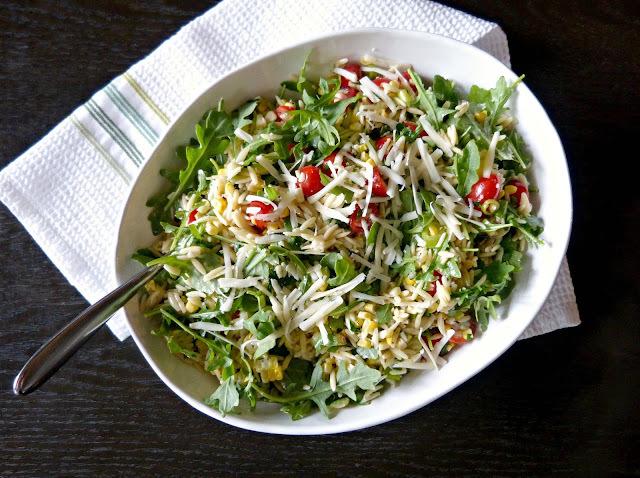 This southwestern-inspired combination of flavors-- along with fresh lime juice and cilantro-- make for a really wonderful and simply seasoned salad. 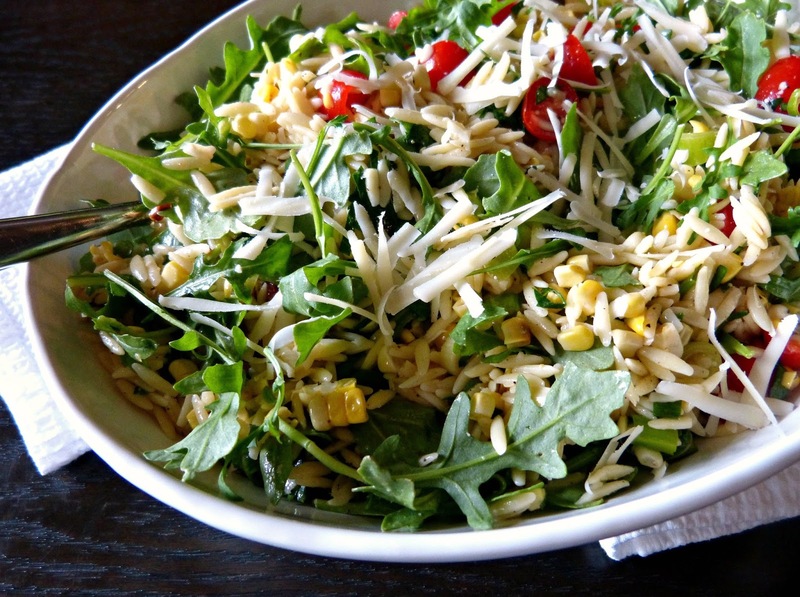 Add some creamy avocado to the mix and you've got one amazing salad in front of you. So, put away the mayo and the hard boiled eggs when you're prepping for your next picnic and just bring this showstopper along instead. 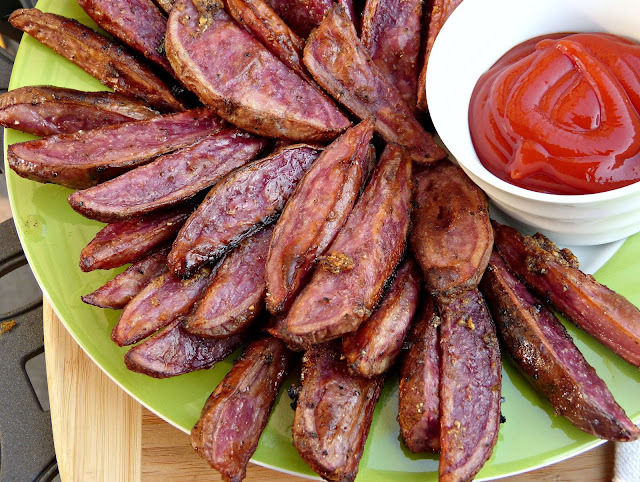 In a large bowl, toss sweet potatoes, peppers, canola oil, and salt and pepper until fully coated. Spread out on a large baking sheet. 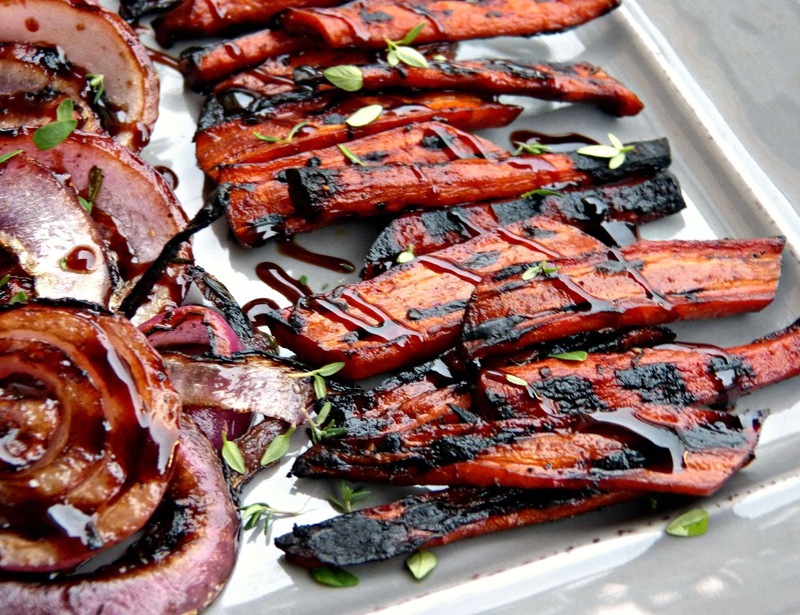 Roast for 25-30 minutes or until sweet potatoes are lightly browned and fork tender. Remove sweet potato and pepper mixture from oven and transfer to a large bowl. Add black beans, corn, red onion, cilantro, lime juice, and additional salt and pepper, to taste. Stir to combine. Serve chilled or at room temperature with fresh avocado. I often go through phases with my cooking and eating preferences. This summer it's all about the wrap. I'm not really sure why I'm suddenly into wraps. They're not cool and new anymore (like they were when I was in college) and we all know now that a flour tortilla is no healthier than two slices of bread, but I bought a package of burrito size tortillas not long ago and I've been on a wrap kick ever since. And while I can't tell you why I decided to get into the wrap habit, what I can tell you is that they're delicious-- and the perfect way to make a portable satisfying summertime dinner. 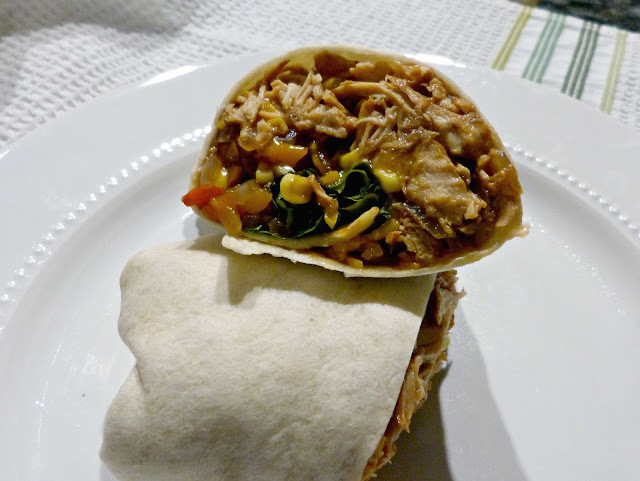 This barbecue chicken wrap recipe has a lot of steps, but is actually quite low maintenance. The chicken comes together over a few hours in the slow cooker and then the only cooking left to do beyond that is sautéing the vegetables. 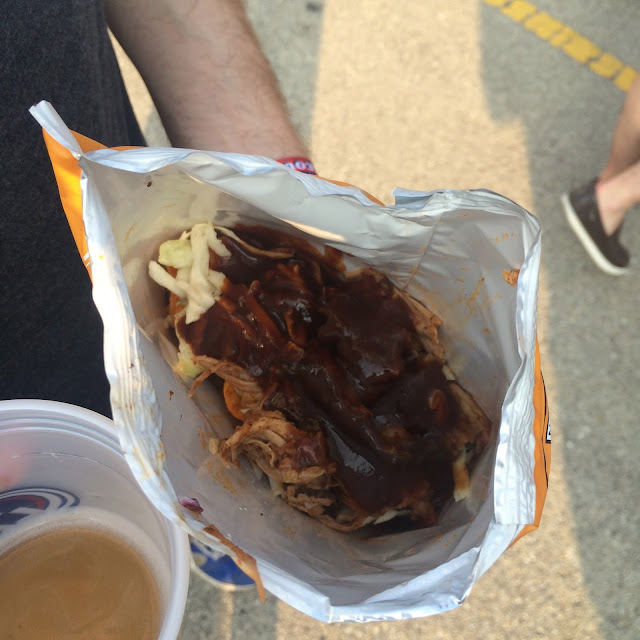 I love the shredded barbecue chicken here because it's so moist and flavorful. 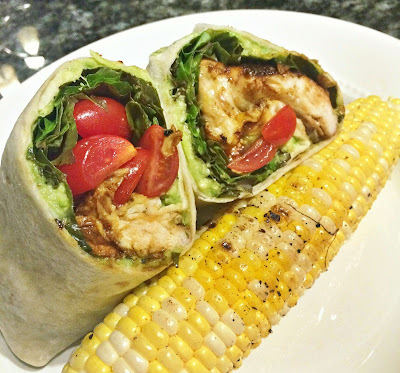 You could really add anything else you wanted to these wraps, but I really like the sweetness of the corn, peppers and onions with the crunch of fresh lettuce. A little melty smoky cheddar plus it all together-- and keeps it all together too! 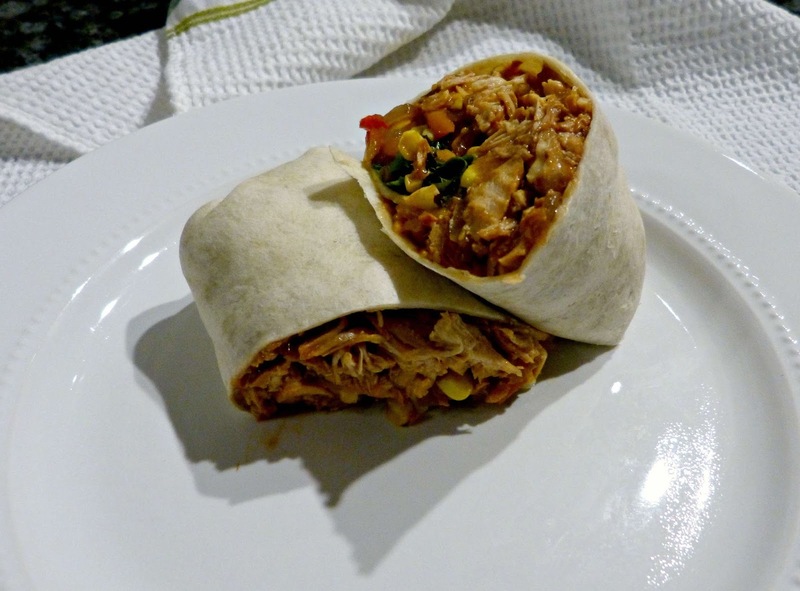 I made another version of these recently with sliced barbecued chicken, tomatoes, and guacamole instead of the pulled chicken, corn, and peppers combo. It was equally delicious and had a great summery feel and flavor. Place chicken breasts in a small or medium slow cooker. Season with salt and pepper and layer in half of the sliced onions. Pour 3/4 cup of barbecue sauce in along with all of the broth. Cover and cook on low for 5-6 hours. Remove the chicken from slow cooker and shred with two forks. Place the shredded chicken in a medium bowl and toss with remaining barbecue sauce. Heat canola oil in a medium skillet over medium high heat. Add remaining onions, the peppers, and a pinch of salt to the pan. Sauté for 10 minutes, stirring frequently until the vegetables are golden and softened. Add the corn to the pan and saute for another 4-5 minutes. Place the two tortillas on a plate and microwave for 30 seconds. Once warmed through, separate the tortillas and begin topping them. Sprinkle cheese evenly over each tortilla, leaving roughly a 2-inch border around the entire edge of each, but working slightly off center so the border is much wider on one side. You'll want this to be the top of the tortillas when looking down at them on your workspace. Top the cheese-covered portion with the pulled chicken, pepper, onion & corn mixture, and then the lettuce leaves. Fold the left and right edges of the tortilla snugly over the filling. While carefully holding those in, use your thumbs to bring up the bottom of the tortilla (side closest to you) and then fold over, rolling the tortilla as tightly as possible and continuing to tuck in the edges until the wrap is closed tightly. Arrange the wrap so that it is lying flap side down on you work surface. Use a sharp (serrated is best) knife to cut the wrap across the center widthwise. Use toothpicks to secure each half, if desired. Until recently, carrots didn't feel like a 'summertime' vegetable to me. I love them in soups on chilly fall days or slow cooked with a pot roast in the winter, but cooking carrots in the summer seemed wrong-- which is actually really silly. Today's recipe post is the perfect way to incorporate carrots into your summer menu! 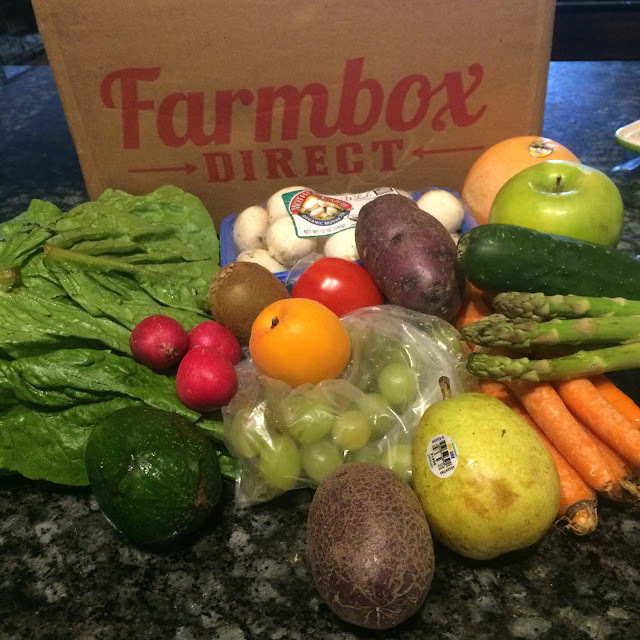 It all began when the folks at Farmbox Direct asked me to give their service a try. Not familiar with Farmbox Direct? This food-focused startup began when one mom decided that it should be more convenient for everyone to have access to locally grown organic and seasonal produce. So she created a service where subscribers receive a regular shipment of in season produce sourced from local vendors right at their doorsteps! The schedule and the amount of produce is all customizable, so you can be sure that the service fits right into your eating and cooking routine. When my Farmbox arrived and I started going through all of the produce I received, my recipe gears started turning. I love grilling in the summertime, but had never thought of grilling carrots until I pulled a lovely bunch out of the box and thought "Why not?" So I cut them into extra thick slices and added some red onion rings to the mix, marinating them in a sweet and tangy combination of balsamic vinegar, honey, fresh herbs, and a touch of pomegranate juice. Marinating the carrots overnight infused some great flavor before grilling them, which added a nice charred smokey quality to the tender carrots. I finished these carrots and onions off with a sprinkle of fresh thyme leaves (which are also in the marinade) and with a drizzle of the reduced marinade. The great thing about a vegetable marinade (as opposed to one used for raw meat) is that it can be re-purposed later in a recipe. Slowly cooking the remaining marinade down turns it into a delicious honey balsamic syrup perfect for topping these veggies off. This is a delicious and summery way to prepare carrots. And it's the perfect summer side dish to any grilled protein. Place the sliced onions in a large zip locking bag. After peeling your carrots, cut them in half widthwise (so you have two long pieces). Place the narrow carrot halves (at the point, not near the stems) in the bag and then cut the thicker halves lengthwise down the center and add to the bag. In a medium bowl, whisk vinegar, oil, honey, pomegranate juice, garlic, rosemary, thyme, salt, and pepper vigorously until fully combined. Pour into the zip locking bag and secure it shut, making sure to push out as much excess air as possible. Refrigerate for at least 8 hours or overnight. Preheat the grill to medium heat. 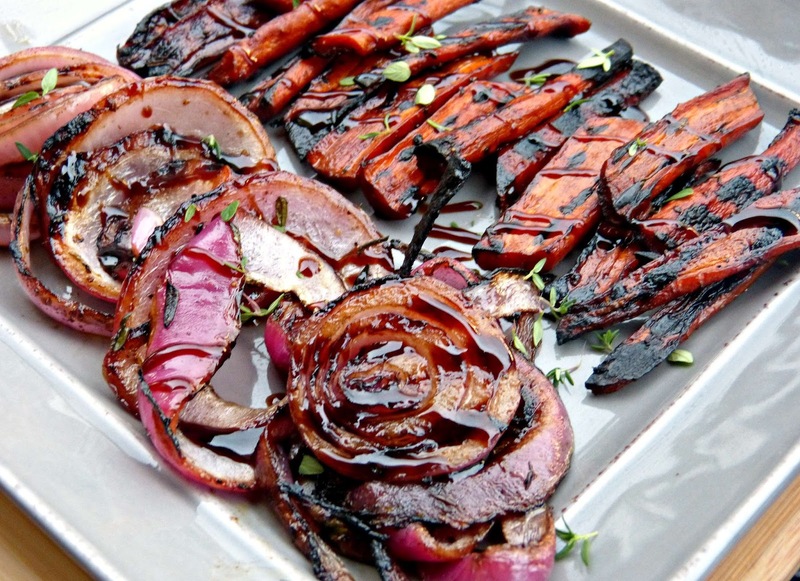 Place the onions and carrots on the grill, reserving excess marinade. Cover and grill for 5-6 minutes (or until they begin to soften and grill marks begin to appear). 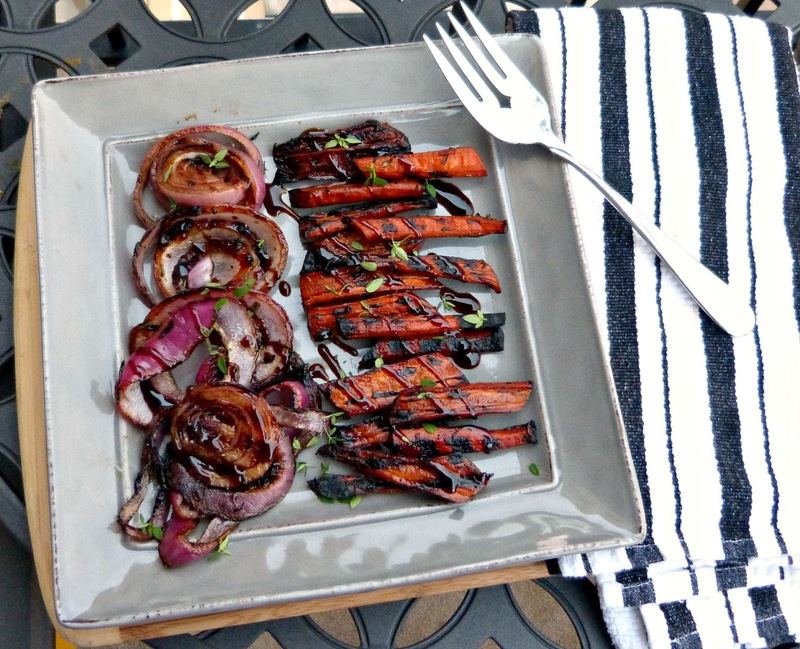 Use tongs to turn the vegetables over and grill the onions for another 3-4 minutes and remove from heat. Continue grilling carrots for another 3-4 minutes, or until desired degree of softness is achieved. Remove from heat. If desired, while grilling the vegetables pour the excess marinade into a small saucepan. Bring to a boil and then reduce heat to medium low. Simmer the mixture, stirring frequently until the mixture thickens and coats the back of a spoon (20-30 minutes). Drizzle over onions and carrots. Editor's Note: I received a complimentary Farmbox Direct sample in order to facilitate this post. The opinions expressed herein are my own. Seasons 52 is a grill and wine bar offering a seasonal menu inspired by local and seasonal ingredients. The chefs at Seasons 52 pride themselves on using ingredients at their peak and simple yet rustic cooking techniques like brick-oven roasting and open-fire grilling over oak and mesquite to bring out the natural flavors of food. 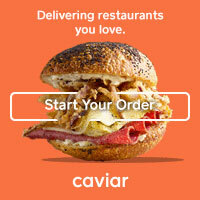 The menu has a distinct focus on dishes that are fresher, more flavorful, and lighter than the average restaurant meal. I was recently invited into their Chicago location in the heart of River North to sample some of the new seasonal menu items here and I jumped at the opportunity-- and brought my friend Kerri (who happens to be Seasons 52's #1 fan) along-- for what was a night of great food, drinks, and service. Our evening began with cocktails, several of Seasons 52's signature flatbreads (like the delicious seasonal chili-glazed duck or lobster & mozzarella options), and a short presentation by executive chef Brad Froelich. He walked us through some of his favorite items on the menu (several of which we tried and I'll tell you about below). It was also interesting to know that Seasons 52 serves more than 100 wines, with 52 available by the glass. They also serve some amazing signature handcrafted cocktails. Kerri and I both began our evening with the refreshing Meyer Lemonade cocktail made with orange Grey Goose vodka, Meyer lemon juice, pineapple juice, and a bit of agave for sweetness. 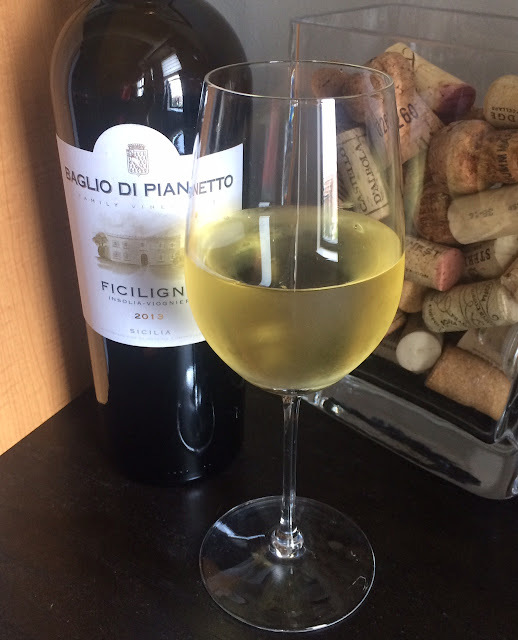 It was a perfect summer cocktail-- and one of those perfectly mixed drinks that doesn't taste too strong of alcohol so it went down all to quickly! Once we were seated and perusing the menu, chef Froelich came around to each table to deliver a bowl of the most gorgeous summery risotto. 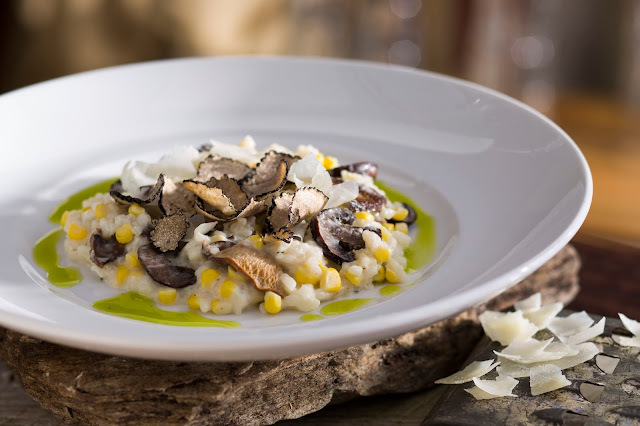 Risotto and sweet corn is slow cooked until creamy with a touch of truffle oil. It was topped off with shaved truffles, fresh Parmesan, and an herby chive oil. This risotto was lighter than the average, but filling enough to be a satisfying meatless entree. We decided to order several more small plates to share and sample, beginning with the crab cake. The crab cake was nice and crunchy on the outside and an interior that was filled with lump crab-- not filler-- served with a tangy mustard dipping sauce. I would also mention that Kerri has a pretty serious butter intolerance. So when the crab cake arrived and we were notified that it was seared in butter, the staff was quick to accommodate her and whisked out a butter-free crab cake in a matter of minutes. One of the highlights of our dinner was the ahi tuna tartare. This generous portion of ahi was layered in a beautiful presentation with some smooth and spicy wasabi avocado mousse and a beautiful tropical salsa filled with pineapple, mango, and peppers. 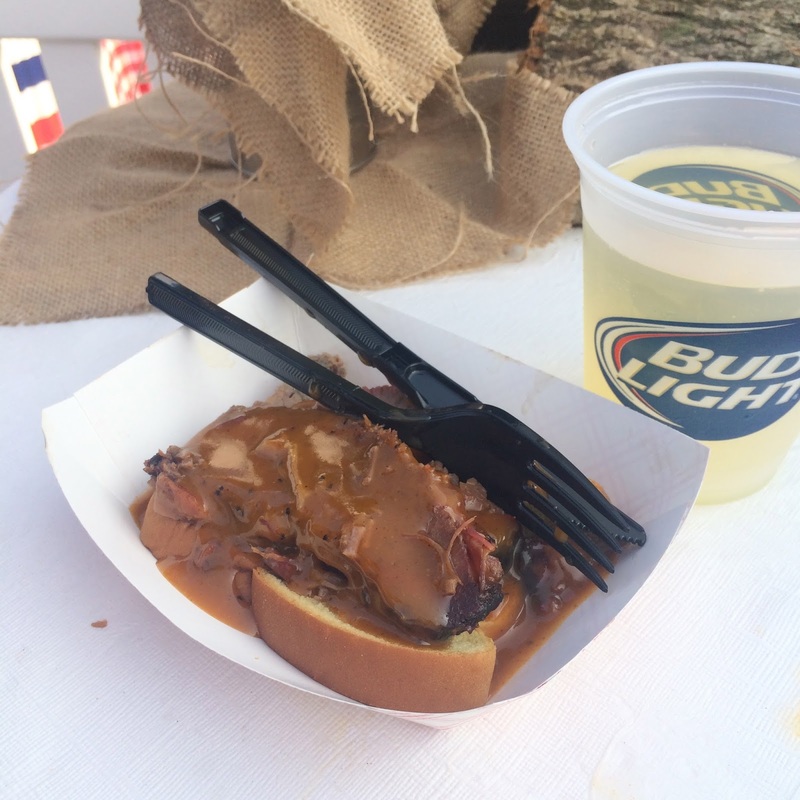 The flavors here were super refreshing with a little sweet and a little heat and this is a perfect light appetizer to start any meal. On the salad front, Kerri and I both loved this creative twist on a caprese salad. Thick slices of sweet heirloom tomatoes were layered with warm mozzarella lightly breaded and crusted in herbs. 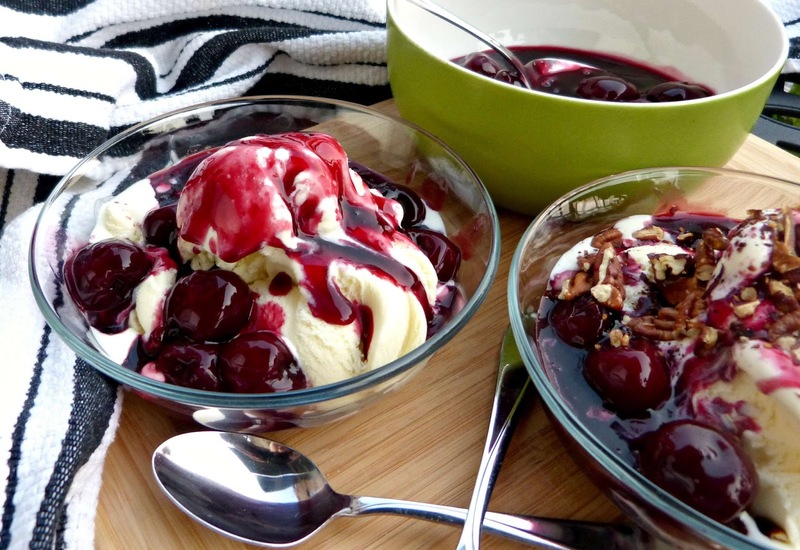 It's lightly drizzled with a flavorful 15-year aged balsamic vinegar. I love that Seasons 52 took one of my favorite flavor combinations and put their own creative twist on it for this delicious and hearty summer salad. For entrees, Kerri opted for the Asian-glazed Chilean sea bass off of the Chef's Suggestion portion of the menu. The presentation of this fish was beautiful with a thick white filet plated on a bed of black rice with sliced shiitake mushrooms and snap peas. The sea bass was finished off with a little micro wasabi on top. This simple Asian-inspired preparation is exactly the kind of dish that Seasons 52 is known for: generous portions with big flavor that's still low on calories. I opted for the caramelized grilled sea scallops for my entree. This dish was plated so beautifully with lots of bright colors from toybox tomatoes and snap peas. There were a ton of scallops on this plate and they were really simply seasoned and perfectly seared. I'm just realizing now in looking back at what we ate that night that there was a lot of corn involved. I can't say I'm made about it though because corn is better in the summertime than in any other season. I couldn't help but order a side of this skillet of roasted corn with our entrees. The sweet roasted corn paired beautifully with crispy bacon, sweet caramelized onions, and Parmesan cheese for a side dish that felt decadent and delicious. And speaking of decadence, dessert is definitely one of the highlights of dining at Seasons 52. 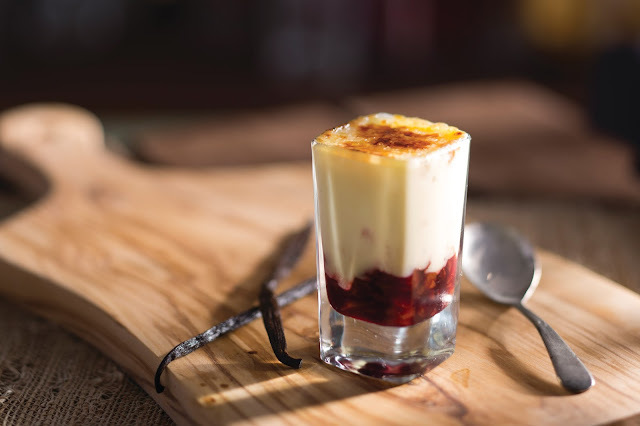 At the end of your meal, your server will bring out an assortment of Mini Indulgence shooters to choose from. Each is a different flavor combination and perfect whether you need just a little something sweet or whether you want to select 2 or 3 (or 4...) for sampling of several different desserts. Kerri's go to order is always the rich Belgian Chocolate S'more with layers of chocolate cake, chocolate mousse, and chocolate chips topped with a toasted marshmallow and a chocolate dipped graham cracker. She also took a mini carrot cake indulgence for the road too! I loved the Bing Cherry Creme Brulee, one of Seasons 52's special summer desserts (pictured above). 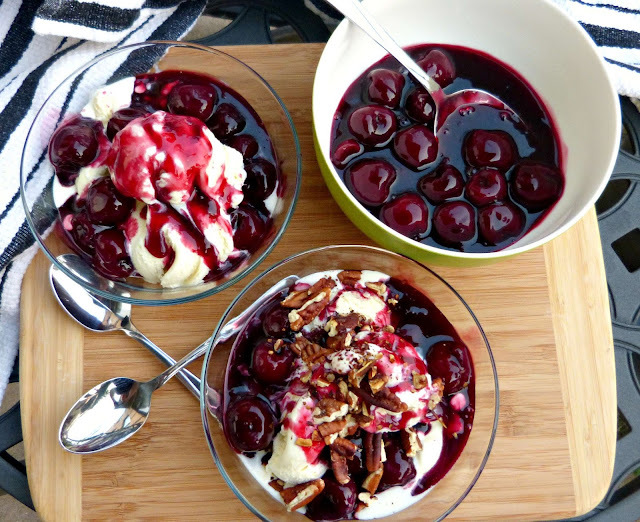 Sweet bing cherries were topped with a thick layer of custard finished off with a sugary crispy crust on top. 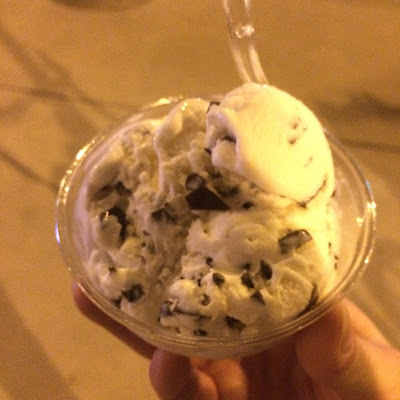 It was so tough to choose between all of their delicious desserts, but this one was perfect for summertime... and the perfect size to end an amazing multi-course meal. 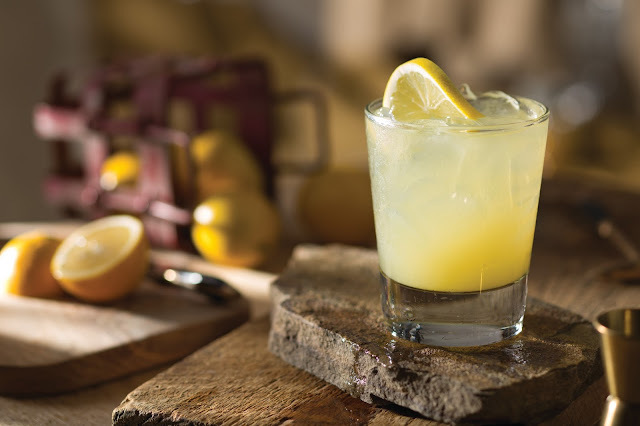 Seasons 52 is a perfect place for girls night, a date, or even a casual drink and snacks at the bar (since they have great happy hour specials via their Sunset at Seasons 52 drink and small plate menu). I love that you can have a big meal with tons of flavor and not feel as if you're in a coma when you're leaving. The chefs here are really adept at adding flavor through fresh ingredients and grilling techniques, which definitely sets them apart from other restaurants. Editor's Note: While our meal at Seasons 52 was complimentary, all opinions expressed here are my own. Thank you for supporting the brands that support A Squared! These baked Chinese five spice fries are a delicious Asian spin on homemade French fries... with a serious kick of heat from new Red Gold & Huy Fong Sriracha hot chili sauce ketchup. French fries are such a guilty pleasure of mine. I have absolutely no willpower when the are around. So, when we go out I normally don't order them because I know I will pretty much inhale them. I also know that 9 out of 10 times, whatever Alex orders will come with a side of fries. And I will sneak several of them off of his plate over the course of a meal. It's a real problem. So when we're grilling at home and making something like burgers or sausages that practically beg to be accompanied by fries, I usually give in. However, at home I like to make a flavorful baked variety that satisfies my need for French fries. Potato wedges are lightly tossed in canola oil and a savory combination of seasoning and then baked until crisp on the outside, fluffy on the inside. I love to change up the seasoning every time I make these fries and recently, we made a soy and sesame marinated steak so it felt appropriate to give these fries a bit of an Asian flair. These fries are coated in a sweet and savory mixture of Chinese Five Spice (a traditional Chinese spice mixture of star anise, cloves, cinnamon, Sichuan pepper, and fennel seeds) with a touch of brown sugar. And by the way, I had picked up these gorgeous purple/red potatoes at the farmer's market that day, hence the unusual color of these fries. Any potatoes you like will work! 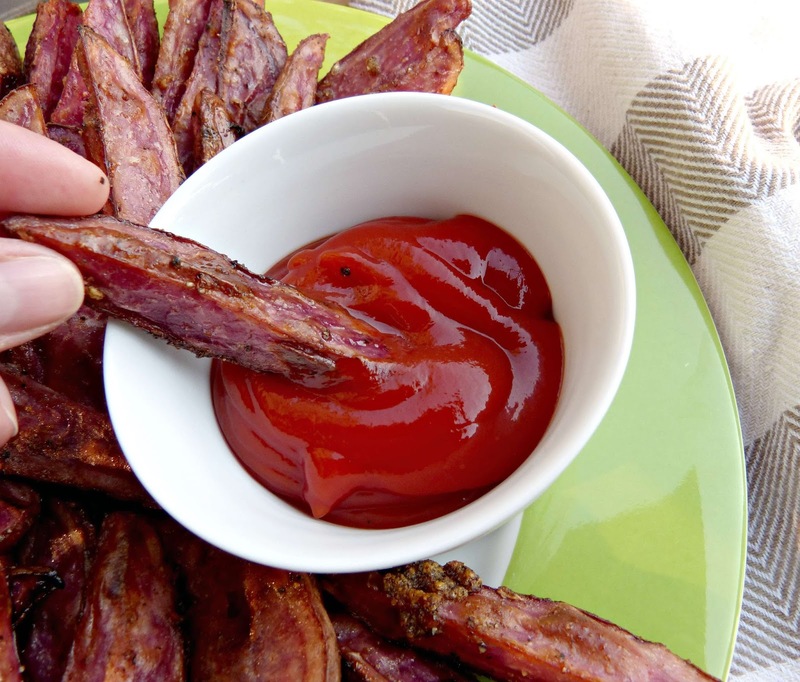 While these fries are already addictively tasty on their own, they are made even more delicious with the addition of some spicy Sriracha ketchup for dipping. This ketchup is perfect for the spicy food lover! It has the tang of ketchup that you love with the fiery heat of sriracha chili sauce. I was blown away by the heat of this ketchup, but loved how it kicked up plain old ketchup a few notches. 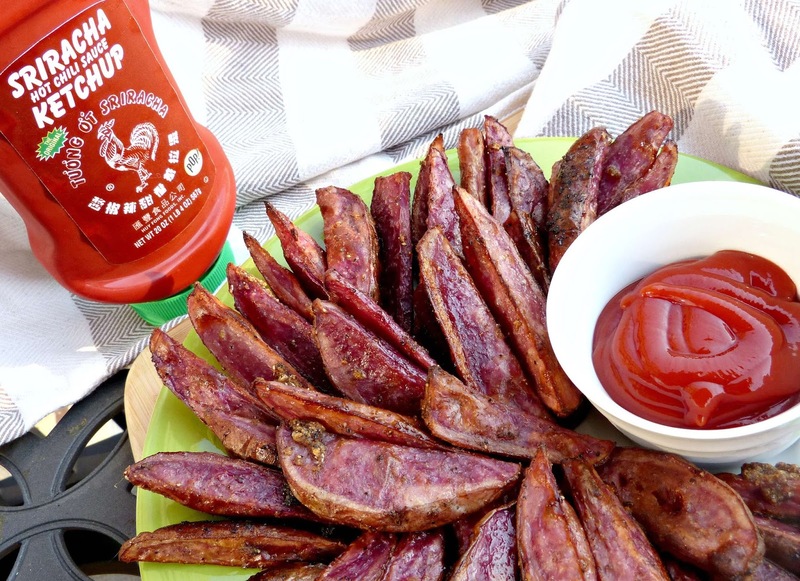 It was great on these sweet and spicy (as in spices, not heat) fries, but would also be so delicious on simple grilled burger or even whisked into a marinade or glaze for roasted pork! Scrub the potatoes until any excess dirt is removed and pat dry. Cut potatoes lengthwise into 1/2-inch wedges. For most potatoes of this size, you can get 6 to 8 wedges out of each one. In a large bowl, whisk together oil, garlic, brown sugar, five spice, salt, pepper, and onion powder. Add potatoes and toss to fully coat. Spread the coated potatoes out on a large baking sheet, making sure to space the potatoes out (so they are not touching). Bake for 25-30 minutes or until the wedges are browned, crisp, and fork tender inside. Remove from oven and serve warm with Sriracha ketchup for dipping. Editor's Note: A sample of sriracha ketchup was provided by my friends at Red Gold to facilitate this post. All opinions expressed here are my own. TGIF. I've got a very special Friday post for you today. As you know, I don't often post on Fridays anymore unless it's something really good. Well, today I have something super fun to share with you: a giveaway! 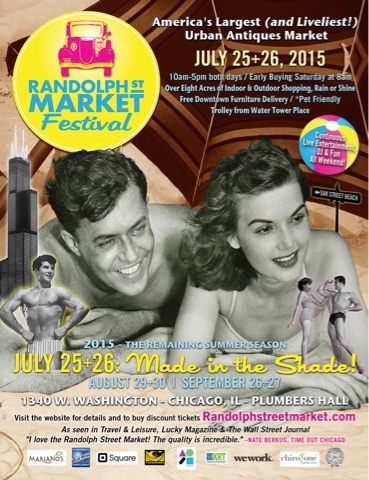 I'm partnering with the Randolph Street Market to offer one lucky reader (and a guest) free VIP admission to this month's event! My girlfriends and I will be brunching in the West Loop and then heading over to the Market for a little shopping and girl talk... I can't wait to check it out! 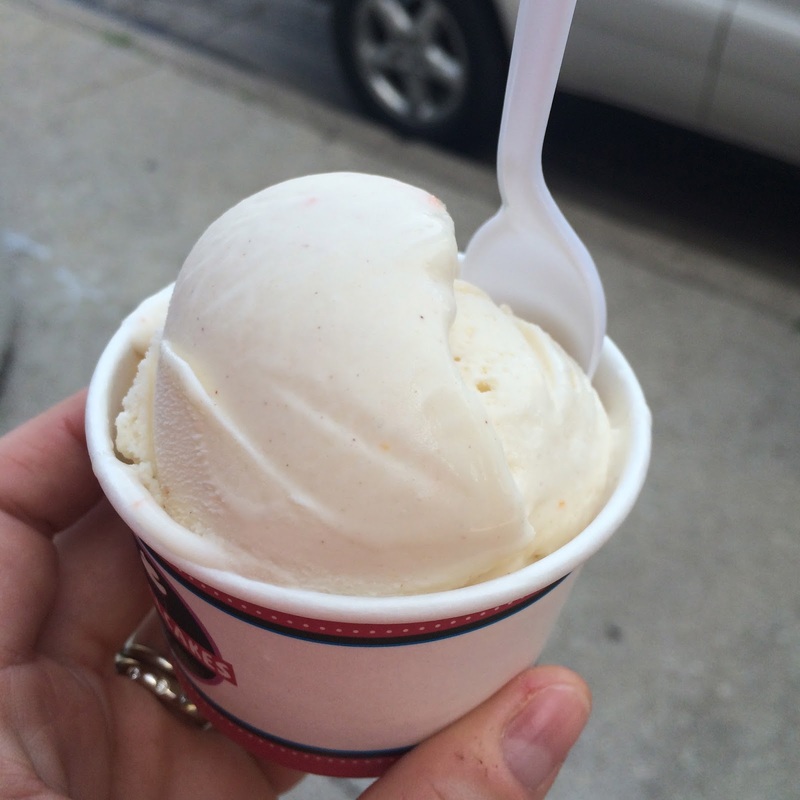 What is the Randolph Street Market, you ask? It is the US's largest urban antiques market and it's right here in Chicago's West Loop. 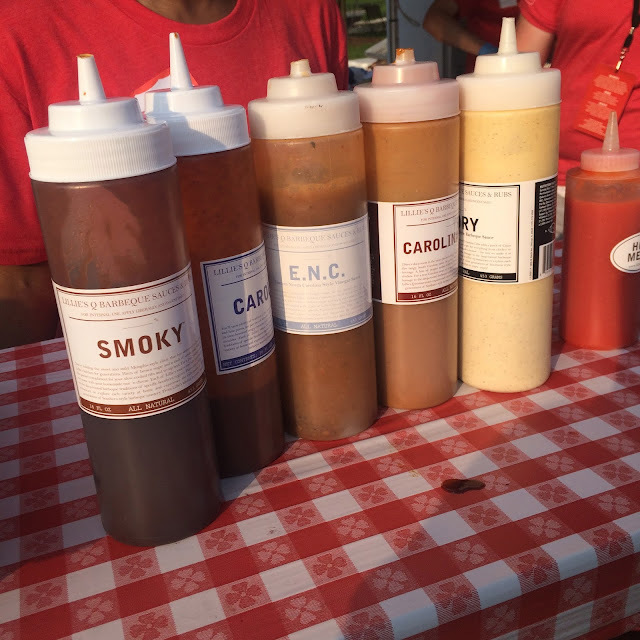 Held a few times throughout the summer, this market encompasses 8 acres and features over 3,000 vendors. So, from jewelry to furniture to cool vintage gifts, there is truly something for everyone here! 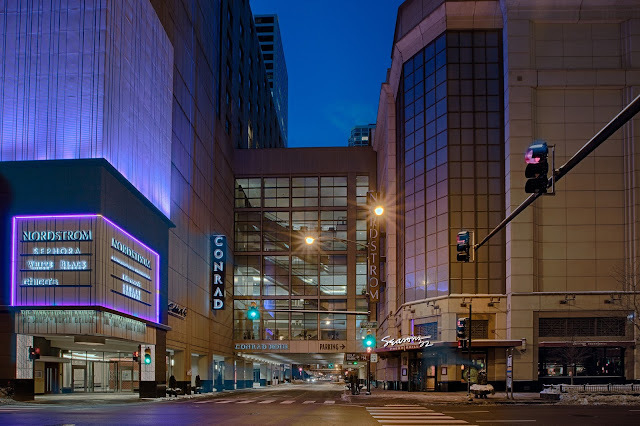 See you on Randolph Street!